Would you believe if I said 'still working on the same level'? Well, that's how it is, anyway. The thing is, this level marked the production-début of one of our cooler minibosses, so in order to get the level done, I had to produce that brute as well. This miniboss took about two weeks to build; The asset creation took about a week and getting it all working in-game took another. Building the object wasn't that straight forward either, as there were a lot of things I wanted to do with this character that the engine just wasn't ready for. Many of these we had 'faked' with previous TAGAPs – like the way the entity blocks the player physically from proceeding – but I really wanted to do things right and with automation. And now it works; Next time I want to use this miniboss, all I need to do is to drop it in and it'll be ready. 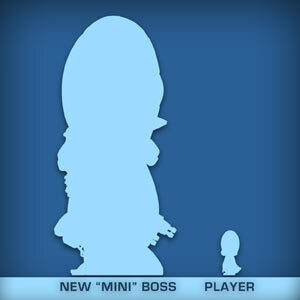 In case you were wondering what this miniboss was, that question will be answered in the not-too-distant future. You see, I saved all the intermediate steps during the asset creation and that produced enough files for a time lapse – the first of its kind for TAGAP! I'll just need to find some time for compiling them into a video, but finishing this darn level is a priority right now. In the meantime, enjoy the scale silhouette on the right! Next up; Special cannon fodder characters for the level. There are a slew of these, but they shouldn't take too much time. And then all we need is to drop everything in place and start playing the level. On gaming front I've almost wrapped up Fallout: New Vegas and all it's DLC, but I just had to take a break from it as the last great game of the 'older generation' of consoles dawns near. I'm of course talking about Castlevania: Lords of Shadow 2. The 'Lords of Shadow' version of the Castlevania universe has a rich and thick lore and I wanted to re-familiarise myself with it before I took a dive into the upcoming sequel. I absolutely loved the first Lords of Shadow; Good gameplay, great characters and a fantasy-tale that reminded me of 80s fantasy classics like The Neverending Story. Not in tone, mind you, but in the way the lore unfolds – you keep encountering mysterious and magical things and instead of trying to make them realistic, overtly cartoonish or explain them to death via plot devices, they are left with a certain aura of believable mystique. But the best bit of the entire game was, obviously, the amazing ending. I'm pretty sure there's a dent in the floor where my jaw dropped when I first saw it. It doesn't just wrap the game up but sets it up for something that could very well be the best and most interesting sequel in history of videogames. So yes, I have high hopes for Lords of Shadow 2. Since I'm not sold on the future consoles and I'm not into buying downgraded versions of games, LOS2 could very well be the last full-priced game I'm buying on Day One, so to commemorate the event I went and pre-ordered that Dracula's casket special edition. Hopefully it'll be worth it! I'll find out soon enough, as according to post tracking Dracula is on the way as I type. Year of The Doctor is indeed behind us, filled with the plethora of specials; The Name of the Doctor, The Night of the Doctor, The Day of the Doctor, The Five(ish) Doctors and of course The Time of The Doctor. All, which by the way, were indeed topped by The Light at the End, just as I predicted. Seriously, it's pure brilliance, do check it out. Anyway, after an year of boombast and grand journeys, were back to the regular programming, but just almost; All the surviving complete stories have now been released, so unless the animation studio Planet 55 goes into overdrive recreating all the missing episodes, the release of new DVDs is down to a trickle. And I do hope they do continue with the recreations as they are fantastic. But the lack of Doctor DVDs means there's more time for Big Finish – and that's a good thing, considering the barrage of greatness already out this year and more on the way. Special mention has to go to Dark Eyes 2, sequel to the now-award-winning Dark Eyes starring Paul McGann and Ruth Bradley. Like the original, this, too, is written and directed by Nicholas Briggs, who again weaves a fantastically paradoxic time travel yarn. I love it and I can't wait for the sequel. Just do yourself a favour; Don't start with Dark Eyes 2, listen to the first one and preferably UNIT: Dominion first. I won't spoil why the latter is on the list, but it'll become obvious if you take it for a spin. Speaking of Big Finish, they do plenty of other stuff besides Doctor Who audios. I haven't had the time to listen to much else, but in September they will be releasing something I'm looking forward to very keenly; Mary Shelley's Frankenstein as a full-cast audio. Not only is Frankenstein my all time literature horror favourite and Big Finish the one studio that could do it justice, but the cast is amazing; Arthur Darvill as Victor Frankenstein and Nicholas Briggs as the Creature, backed by Georgia Moffett, Geoffrey Beevers and Terry Molloy! And finally, since I haven't commented this on the blog 'till now; As much as the departure of Matt Smith saddened me, I can't wait to see Peter Capaldi taking the TARDIS for a spin. The brief glimpse we saw from the 12th Doctor was amazing and if both the writers and Mr. Capaldi can keep that up, he just might become my favourite TARDIS tenant to date. Time will tell. No pun intended.